Great value pack. 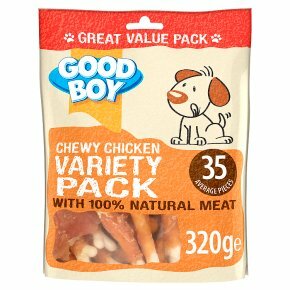 With 100% natural chicken breast meat. Packed with all their favourites. Low in fat. Feed as a treat as part of a nutritionally balanced diet. Check that your dog has plenty of clean, fresh water available - just in case they get really thirsty. These treats should be given under supervision, on a non-stainable surface. Not suitable for puppies under 4 months. To avoid a potential choking hazard, ensure you choose a treat which is an appropriate size for the breed and age of your dog. This pouch may contain a deoxidiser sachet which must be discarded and not fed to your dog.<br>Warning: This product is packed on a site that handles nuts and peanuts.